In autumn 2013, the Porsche Experience Center Los Angeles will open its doors as the new home of Porsche Cars North America. Porsche Motorsport North America will also move its location from Santa Ana to Carson, California, where an ultra-modern workshop and administration building as well as a test and handling track is under construction on a terrain covering more than ten hectares. The battle for victory at the sixth race in Belgium’s Spa-Francorchamps (24 June) was played out between Porsche works driver Marco Holzer and Manthey pilot Nick Tandy in the 911 GT3 RSR of Manthey Racing against factory pilot driver Patrick Pilet and his compatriot Raymond Narac in a 911 GT3 RSR fielded by IMSA Performance Matmut. 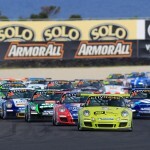 After 50 minutes, the Manthey Porsche won with a 34-second advantage over IMSA Performance’s 911. In Saturday’s race, Holzer and Tandy were forced to retire with tyre damage, Pilet/Narac finished in fourth and travel to the next meeting in Brands Hatch (14/15 July) as the new points’ leaders ahead of Holzer and Tandy. At the third of seven races of the British GT Championship in Rockingham (10 June), Steve Tandy and Joe Osborne saw the flag in first after two hours at the wheel of Trackspeed Racing’s 911 GT3 R. David Ashburn and Phil Keen yielded third place with the sister car. Ashburn holds on to position two in the drivers’ classification. Anthony Beltoise and Henry Hassid took victory from both the second and third weekend in Dijon (19/20 May) and Val de Vienne (23/24 June) respectively with their 911 GT3 R run by the Pro GT by Almeras and now rank second in the points. Laurent Pasquali and Franck Perera in the second Almeras-911 GT3 R had won a race in Dijon, but had to settle for eighth and zero points in Val de Vienne. Pole Position and victory in the GT 300 class for Japan’s Masami Kageyama and Tomonobu Fujii in the Hankook-Porsche 911 GT3 R at race three in Sepang, Malaysia. Naoki Yokomizo and Kyosuke Mineo took off from third on the grid in the 911 GT3 R of Endless Taisan, fell back to 19th after a spin, but after a spectacular drive finished on second and conquered the top of the points’ table. A strong outing for the Italian Autorlando Sport team at round three in the Motorland Aragón, Alcañiz (17 June). Miguel and Joao Ramos took up the race from pole position. When the brothers retired with gearbox problems at the halfway mark of the 130 minute race, Alvaro Fontes, Jesús Díez Villaroel and Gianluca Carboni were ready in the wings with the second Autorlando Sport 911 GT3 R and brought home victory for the Italian squad. 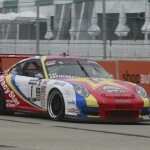 The 29-year-old GT and touring car specialist Lawson Aschenbach was one of the favorites to win the double-header on the Belle Isle circuit in Detroit (2/3 June) in the 911 GT3 Cup fielded by Truspeed Motorsports but had to settle for two second places. Both times lengthy caution phases hindered his campaign to take the leader. With a clear advantage of almost 0.6 seconds, René Rast beat the entire field in qualifying at the wheel of his Lechner Racing 911 GT3 Cup and won the fifth round in Valencia (24 June) impressively with a gap of more than eleven seconds over Sean Edwards and Robert Lukas. Four weeks earlier, Edwards had won the 16-lap sprint from pole position in his adopted home of Monaco and now travels to Silverstone (8 July) as the leader of the championship. Kévin Estre (Hermes Attempto Racing) from France won race five on the 25.4 kilometer combination of the Nürburgring-Nordschleife and the Grand Prix circuit (19 May) and earned a stack of championship points with two second places on the Red Bull Ring (2/3 June). The winners of the races in Austria’s Styria region were Norbert Siedler (Konrad Motorsport) and Sean Edwards (Team Deutsche Post by tolimit). Great achievement for the talented youngster supported by Porsche: At his home race, 20-year-old Porsche-Junior Klaus Bachler (Team Deutsche Post by tolimit) secured third in Saturday’s race. After scoring two clear victories on the Norisring (30 June/1 July) seasoned campaigner René Rast moved to the top of the points’ table. Switzerland’s Alexandre Imperatori won races three and four of the Carrera Cup Asia in Zhuhai, China (1/3 June) in the Porsche 911 GT3 Cup of PICC Team StarChase. Imperatori’s first win was from pole position, with second place going to Rodolfo Avila ahead of Benjamin Rouget. Race two also went to Imperatori in front of the reigning champion Keita Sawa, Rodolfo Avila finished in third. 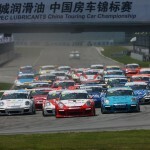 Heading to races 5 and 6 in China’s Ordos (6/8 July), Imperatori leads the drivers’ championship ahead of Sawa. There was no way around Côme Ledogar and his 911 GT3 Cup fielded by Pro GT by Almeras at all three races of the third weekend in Val de Vienne (23/24 June). The 21-year-old climbed to the top of the podium after every race and at the season’s halfway mark leads the championship ahead of Jean-Karl Vernay (Sebastién Loeb Racing). With two pole positions and his first two victories, Scotsman Rory Butcher (Celtic Speed) surprised his rivals at races nine and ten in Croft (23/24 June). Series’ leader Michael Meadows retired from race one and finished race two of the weekend in second place, slashing his points’ advantage by half over Jonas Gelzinis. Two weeks previously, Team Park pilot Sam Tordoff celebrated his first victory at the seventh race in Oulton Park, with Meadows following up with a win from race eight. At races three and four in Mugello (9/10 June), Matteo Malucelli (Antonelli Motorsport) and Edoardo Piscopo (Petri Corse) joined the list of winners. With his win, Malucelli nudged Daniel Mancinelli off the top of the points’ ladder. Victory at the first and second races in Vallelunga went to Vito Postiglione and Daniel Mancinelli. The IMSA Performace Matmut outfit with drivers Nicolas Armindo, Anthony Pons and Raymond Narac occupy second in the GTE Am class at the Le Mans 24 Hours (16/17 June) with a 911 GT3 RSR. Junior driver Ryo Hirakawa, who receives support from Porsche Japan, wins both races of the Carrera Cup Japan in Fuji (4/5 June) and now leads the championship. 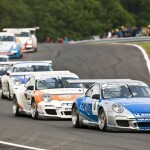 Johan Kristoffersson triumphs at the third of seven rounds of the Carrera Cup Scandinavia in Sturup (SWE, 16 June). 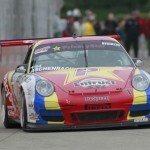 Sean Johnston wins the IMSA GT3 Cup Challenge by Yokohama race in Montréal (10 June). That green and yellow car looks amazing. Grats to Ryo, I was hoping he would win.